The Mac and iOS software developer Panic has had the source code for several of its apps stolen. Panic founder Steven Frank admitted in a blog post that it happened after he downloaded an infected copy of the video encoding tool Handbrake. He said there was no sign that any customer data was accessed and that Panic's web server was not affected. Users have been warned to download Panic's apps only from its website or the Apple App Store. Panic is the creator of web editing and file transfer apps Coda and Transmit, and co-published the video game Firewatch with developers Campo Santo. On 2 May Handbrake was hacked, with the Mac version of the app on one of the site's download servers replaced by a malicious copy. The infected app was discovered and removed on 6 May. In what Mr Frank called "a case of extraordinarily bad luck", he downloaded the malicious version of Handbrake and launched it "without stopping to wonder why Handbrake would need admin privileges… when it hadn't before". "And that was that, my Mac was completely, entirely compromised in three seconds or less." The attacker then used his password to access other private files and copy the source code for several of Panic's products stored on the infected computer. The theft was confirmed when Panic received an email containing some of the files and demanding a ransom for the return of the complete code. "We're working on the assumption that there's no point in paying," Mr Frank wrote, saying that "the attacker has no reason to keep their end of the bargain". The FBI is investigating the incident and Panic has been working with Apple to make sure that no malicious or fake versions of the apps get into the App Store. "I feel like a monumental idiot for having fallen for this," Mr Frank admitted. "It's a good reminder though — no matter how experienced you might be with computers, you're human and mistakes are easily made." 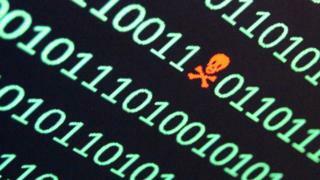 Cyber-attack glossary: What are malware, patches and worms?